It's an interesting question as to where the "Tokyo" is on the highway signs that line the arteries of Japan. The city is a large place after all. It can't all be the same distance away. Well, that's true, it isn't. Around the world cities adopt a specific location and then everything is measured to that point. Often this will be the City Hall but not always. For New York, distances are measured to Columbus Circle at the southwest corner of Central Park. In London, it's the statue of Charles I in the courtyard of Charing Cross, a stone's throw from Trafalgar Square. And in Japan, distances to "Tokyo" are measured to Nihonbashi, the historical bridge at the start of the ancient routes linking Tokyo to Kyoto. The administrative capital to the Imperial capital. The original wooden structure, built in the early days of the Tougawa Shogunate, was eventually replaced by the larger stone structure still standing today. Over the next 300 years the area boomed being at the centre of not only transport, but also bordering the seat of Government on one side and the traders of Ginza on the other. The Mitsui family located their new store, Mitsukoshi, there and a lively food market grew up with the associated bustling noise and distinctive odour of the fish merchants, much to the disdain of the mandarins of the western fringes. And then Tokyo suffered a direct hit. Some 140,000 perished in the fires and aftermath of the 1923 earthquake. Downtown was razed as a firestorm ripped through the city. And the men in grey kimono saw their chance at last. The recently abandoned foreigner's enclave in Tsukiji, a couple of miles to the south, would be perfect for a new, improved, fish market they argued. It's near to the river, closer to the bay and freely available. It was also not in their backyard. 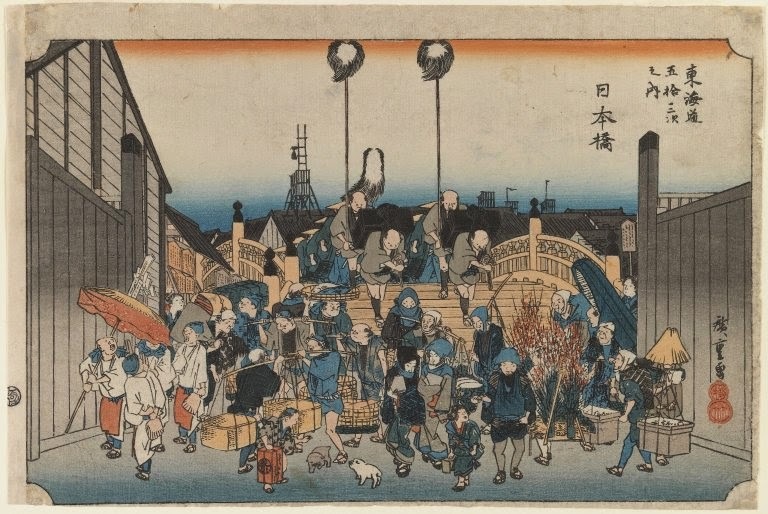 The fish merchants were pushed out and Nihonbashi returned to being a "civilised" district once more. And then, for the 1964 Olympics, they built a massive highway on top of it. And you'd no longer know that this is the place where Japan begins.